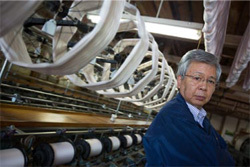 Saiei Orimono in Kawamata is the purveyor of the world's finest silk. Gavin Blair visited the Fukushima Prefecture-company, which continues its pursuit of highest-quality merchandise in the most difficult of times. At only 16 percent the thickness of a single strand of human hair, the Fairy Feather silk developed by Saiei Orimono of Kawamata, Fukushima Prefecture, can lay claim to being the finest available in the global marketplace. Winner of the Prime Minister's Award at this year's Monodzukuri Nippon Grand Awards, the ultra-thin silk is the latest development in a craft that is said to have existed in the Kawamata area for nearly a millennium and a half. The secret to the company's silk is its fine and light but durable qualities, according to Yasuyuki Saito, president of Saiei Orimono. 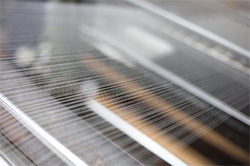 The vertical and horizontal threads can also be woven with variations in the shades of the silk, giving the finished product a shimmering look that changes color slightly as it moves. 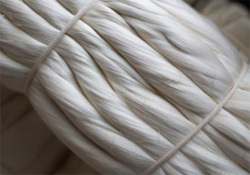 The company currently has seventeen employees, with five "masters" of the five crucial skills required for silk production. New staff must spend a year learning each of at least three of them. The Kawamata area has been making silk scarves for export for more than a century, though they were known outside Japan as "Yokohama Scarves" after the port city south of Tokyo from where they were shipped. Saito's father worked at a trading company in Yokohama which had sent silk to Fukushima for it to be made into handkerchiefs and then sent back to the port for export to the United States. He later decided to relocate to the Kawamata area where the companies with which he had been trading were located, and founded Saiei Orimono. Like most companies in the apparel or fabrics business, Saiei Orimono has been vulnerable to the vagaries of trends and fashions. "When the current Crown Prince married Princess Masako , there was a 'scarf boom' in Japan because the princess liked to wear silk scarves, but since then they haven't really been popular," explains Saito. The silk producers of the area have shifted their focus to traditional Japanese wear and wedding dresses. The lightness of Saiei Orimono's silk has made it a popular choice with designer Yumi Katsura, who has been using it for wedding dresses for three decades. 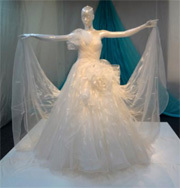 Due to Katsura's penchant for the fabric, many other makers of bridal wear now also utilize the fine silk in their own creations, according to Saito. The office and factory of Saiei Orimono were damaged by last year's March 11 earthquake and tsunami, yet 80% of Saito's staff came to the company the next day, despite it being a Saturday, and every one of the employees had turned up for work as normal within two weeks. "The office and factory were a mess, with stuff all over place, things broken and the equipment out of alignment. But all the staff came to help clear up." On this note, Saito reflects, the biggest influence of the disasters has been that people have come to realize the importance of human relations, of friends and family, and the ties that bind them together. 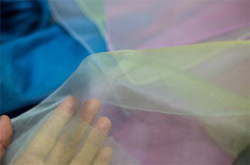 Looking forward, the company is working on opening sales channels for its award-winning Fairy Feather silk in Europe, with one French company having already taken samples and now considering whether to begin using the unique fabric. Gavin Blair is a freelance journalist living in Tokyo who writes for publications in the United Kingdom, United States and Asia.